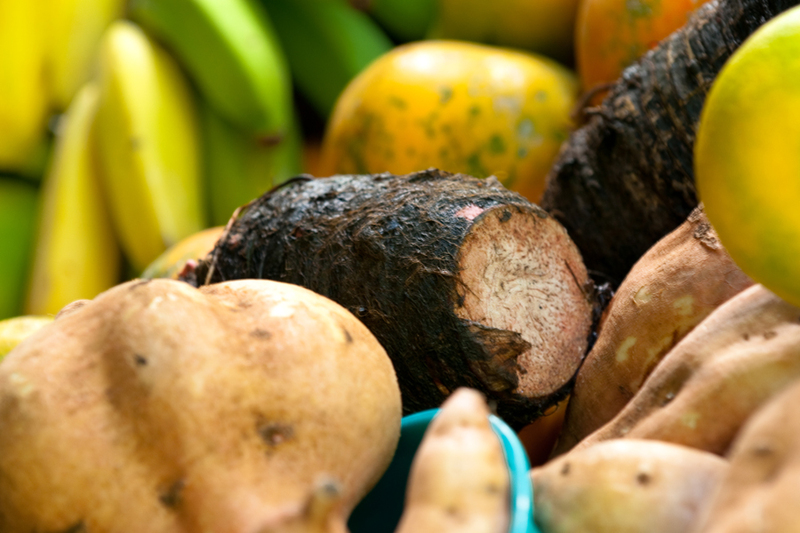 What is kalo? 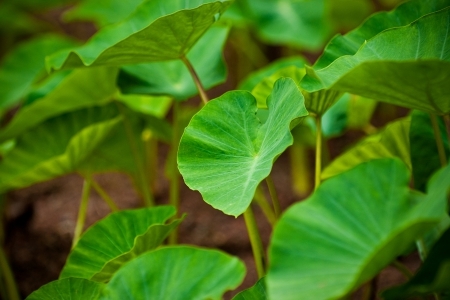 What is a loʻi kalo? What is a kuleana? Why does somebody need to take care of the ʻāina? Do things grow automatically? A mahi ʻai, or farmer, supports his family and village by taking care of the ʻāina. Do you know any mahi ʻai? What is their lifestyle? What is the difference between kalo farming and wheat or corn farming in the United States? Why does ʻAnakala Kyle consider his hands to be a tool? ʻAnakala Kyle’s grandparents and their grandparents gifted the ʻāina to him, and he is now farming it. What kinds of things have been passed to you form your parents and grandparents? What is your responsibility in taking care of those things? Think about your home or yard. Is there a place where you could plant fruits or vegetables? On a piece of paper, draw a plan for a small garden. Then talk with your family about planting and taking care of fruits or vegetables. He keiki aloha nā mea kanu. Beloved children are the plants. It is said of farmers that their plants are like beloved children, receiving much attention and care. In the late 1700s, there were about one million kānaka ʻōiwi (Hawaiians) in Hawaiʻi—almost the same number as Hawaiʻi’s total population today. Because there was such a thriving population, kānaka ʻōiwi developed revolutionary techniques to feed the people while maintaining a balance with the natural environment. 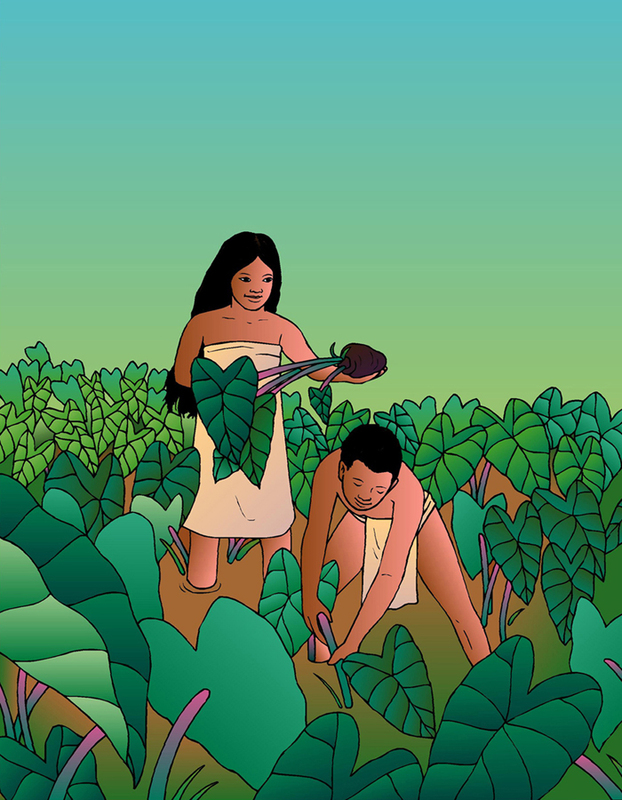 Mahi ʻai (farmers) and lawaiʻa (fishermen) were the professionals responsible for feeding the masses. Mahi ʻai are experts in food cultivation. They are also experts in understanding the movement of water and weather patterns. Mahi ʻai developed massive wetland agricultural systems that stretched for miles. They also developed complex irrigation methods to allow food to be grown in dryer areas. I hāna ka pō, i hāna ke ao. Alert by night, alert by day. Said of a farmer or fisherman who begins work before sunrise and continues into the daylight hours. 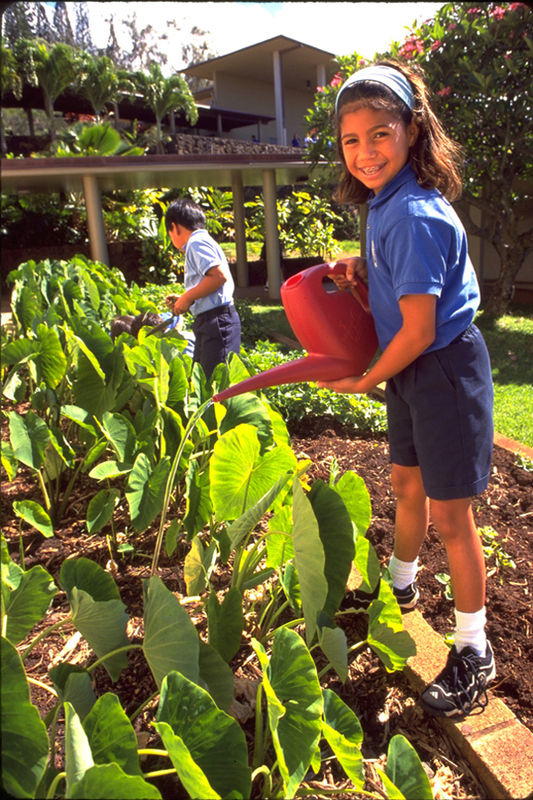 The primary function of the mahi ʻai is to grow food. Kānaka ʻōiwi had many food plants including ʻuala (sweet potato), ʻulu (breadfruit), uhi (yam), kō (sugarcane), maiʻa (banana), niu (coconut) and kalo (taro). These plants were cultivated to maximize the amount of food that could be produced each season. Plants were grown in loʻi (irrigated fields) or in māla (non-irrigated gardens). The most important food plant for kānaka ʻōiwi is the kalo. 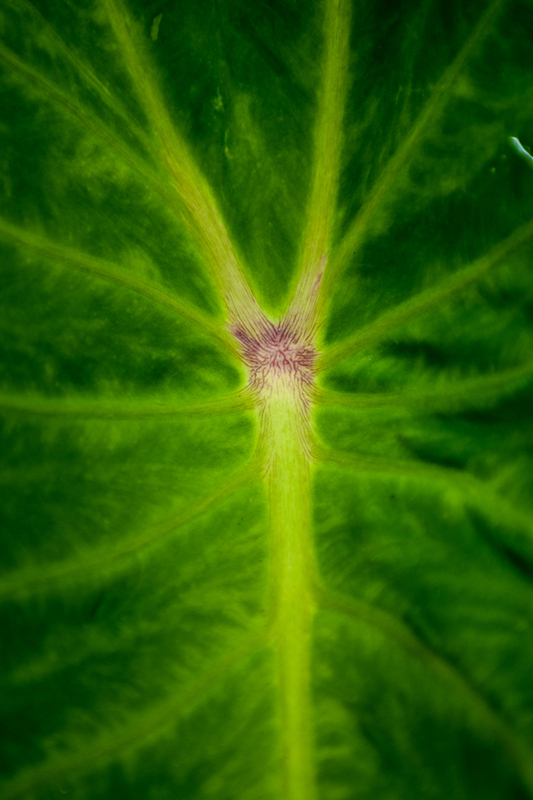 Kalo is grown in both loʻi and māla. Kalo, more than any other food sources, has a special relationship with kanaka (people). An example from Hawaiian genealogy illustrates this relationship. Hāloa is regarded as a common ancestor of kānaka ʻōiwi. Moʻolelo (histories and legends) tell us that Hāloa did not survive his birth. He was buried in the ground. Later, in the same place he was buried, the first kalo plant began to grow. Because of this, kalo is the older sibling to kānaka ʻōiwi and has the responsibility to feed kānaka. Likewise, kānaka, as the younger siblings, have the duty to care for the elder sibling, Hāloa, and the ʻāina. Kānaka therefore share a familial relationship with kalo and the ʻāina. Kānaka believe there is mana (spiritual power) in growing, harvesting, and eating the foods from the ʻāina. For kānaka, being involved in any or all of these processes allows one to gain mana. This increases an individual’s health. ʻO kāu aku, ʻo kā ia ala mai, pēlā ka nohona o ka ʻohana. From you and from him—so lived the family. The farmer gave to the fisherman, the fisherman to the farmer. Imagine you’re a farmer and you have only so many cuttings from which to grow food. You want to make sure those cuttings don’t wash away in the rainy season or dry out if there’s not enough rain. How would you know when to plant to maximize your harvest and keep foo on your plate? As a mahi ʻai, you would use the cycles of the moon to determine the best time to plant and harvest crops. The mahi ʻai of old had temples called māpele. There they would pray to Lono, the principal god of agriculture. Other gods associated with providing sustenance are Kāne, the god of fresh water, and Kanaloa, the god of the ocean. They would also practice mele oli (chants) and pule (prayers) to petition the akua for rain and abundant crops. Traditionally, the main tools of the mahi ʻai have been their hands, feet, and the ʻōʻō, or digging stick. The ʻōʻō is a long, thick stick made of strong wood such as ʻalaheʻe. ʻŌʻō are used to loosen the soil, remove rocks, and harvest crops. Loʻi are constructed in flat areas near streams or springs. Terraces are built to take advantage of the slope of the terrain. Water is irrigated from pond to pond, then finally back to the stream. Irrigation ditches are called ʻauwai. It is said that the water at the bottom of the stream would be as clean as the water at the top of the stream. Loʻi are constructed by the community. First the land was cleared, then the terrace walls are built and the soil prepared. Traditionally māla are usually found in an area called the kula (plains) lands. Kula lands receive about forty inches of rainfall a year. These are favorable conditions for growing ʻuala. Mahi ʻai construct walls and mounds to trap moisture and protect their gardens from the wind. Larger plants and trees were also used to trap moisture and protect smaller plants from harsh weather. Plant material from kukui and lāʻī are used as mulch. Mahi ʻai work very closely with the community to manage the māla and loʻi. Don’t have an ʻōʻō handy? You may be able to find metal ʻōʻō at your local hardware store. Kuehu ka ʻai hoʻopau a ka ua. Shaken up are the products over which the rain did its best to produce. Said of good crops as a result of showers. ʻOihana mahi ʻai is still a profession today. Kānaka ʻōiwi are continuing to turn toward the land to provide for their ʻohana and communities. In fact, there is an increase in mahi ʻai practices. There are loʻi and māla built to service communities. They are cared for by the kānaka in their communities. For example, Ka Papa Loʻi o Kānewai is a loʻi at the University of Hawaiʻi–Mānoa. This loʻi is used to teach traditional mahi ʻai practices to college students and the community. The kalo produced from the loʻi also provides food for kūpuna (elders) in the surrounding area. There is an increase in understanding and appreciation of the kuleana of mahi ʻai.